Financial inclusion is the availability of banking services at an affordable cost to disadvantaged and low-income groups. In India the basic concept of financial inclusion is having a BSBD account with any bank. In reality it includes loans, insurance services and much more, the main purpose being to bring these underprivileged sectors to the organized	Banking Activity. The first-ever Index of Financial Inclusion to find out of reach of banking services among 100 countries, India has been ranked 50. Only 34% of Indian individuals have access to or receive banking services. In order to increase this number the Reserve Bank of India and the Government of India has taken a lot of innovative steps. One of the reasons for liberal opening of new branches in rural area was to make sure that the banking service is accessible to the poor. With the directive from RBI, our banks are now offering BSBD Accounts to low income groups. In Karnataka, 1.94 crores BSBD accounts opened having balance of Rs.2740 crores.These accounts are with some restriction in transactions. Banks are now considering FI as a business opportunity in an overall environment that facilitates growth. The main reason for financial exclusion is the lack of a regular or substantial income. In most of the cases people with low income do not qualify for a loan. The proximity of the financial service is another fact. The loss is not only the transportation cost but also the loss of daily wages for a low income individual. Most of the excluded consumers are not aware of the bank’s products, which are beneficial for them. Getting money for their financial requirements from a local money lender is easier than getting a loan from the bank. Most of the banks need collateral for their loans. It is very difficult for a low income individual to find collateral for a bank loan. Moreover, banks give more importance to meeting their financial targets. So they focus on larger accounts. It is not profitable for banks to provide small loans and make a profit. All these reasons prompted the Government to come out with elaborate plans to reach this unprivileged sector. The relaxed KYC norms, nil balance accounts and the ICT based BC model to reach the interiors of the country are some of the main drivers to achieve the objective. Financial inclusion mainly focuses on the poor who do not have formal financial institutional support and getting them out of the clutches of local money lenders. As a first step towards this, some of our banks have now come forward with general purpose credit cards and artisan credit cards which offer collateral-free small loans. The RBI has simplified the KYC (Know your customer) norms for opening a BSBDA account. The Indian Government has a long history of working to expand financial inclusion. Nationalization of the major private sector banks in 1969 was a big step. In 1975 GOI established RRBs with the same aim. It encouraged branch expansion of bank branches especially in rural areas. The RBI guidelines to banks show that 40% of their net bank credit should be lent to the priority sector. This mainly consists of agriculture, small scale industries, retail trade etc. More than 80% of our population depends directly or indirectly on agriculture. So 18% of net bank credit should go to agriculture lending. Recent simplification of KYC norms are another milestone. Syndicate Bank being the convenor of the State Level Bankers’ Committee (SLBC), Karnataka, a forum representing all the Banks in State of Karnataka, has been a flag bearer in this new endeavor. With active support from the State Government and Reserve Bank of India, we are working closely to see that EBT (Electronic Benefit Transfer) payments of SSP (Social Security Pension) and wages under MGREGS (Mahatma Gandhi Rural Employment Gurantee Scheme) are paid through smart cards/Rupay in seven districts of Karnataka viz., Bellary,Chitadurga,Gulburga,Yadagir under one District many Bank Model and Chamaraja Nagar,Dharwad and Mandya under one District one Bank Model. Implementation of various F.I. Schemes and Initiatives in Karnataka. All the identified 3395 unbanked villages have been provided with banking outlets by the banks, thereby achieving cent percent coverage. It comprises BCAs-2855 (including BCAs in 1527 USBs), B & M Branches-513 and Mobile Vans-27, aggregating to 3395 as on Mar. 2015. In terms of guidelines of RBI ,SLBC had informed all the Banks and LDMs to finalise Roadmap with details of allocated villages (district-wise) as per the formats prescribed by RBI. In terms of RBI guidelines, Banks have been allocated the villages having population less than 2000 based on Gram Panchayat model in their respective districts. There are 23126 villages identified with < 2000 population. A total of 22129 villages are covered upto Mar. 2015 as against cumulative target of 22345 villages upto March 2015. A roadmap has been prepared with the provision of opening B & M Branches and submitted to RBI. Further, RBI has advised that at-least 5% of the villages allotted under this category shall be provided with banking outlets in the form of Brick & Mortar branches. Accordingly, 289 villages are covered by B & M branches up to Mar. 2015. With the renewed thrust given to Financial Inclusion and Financial Literacy, the opening up of FLCs has further assumed significance, as Financial Literacy is conceived as key to the success of Inclusive Growth through Financial Inclusion. There are 126 FLCs opened till March 2015. The Banks have conducted Household survey in the allotted SSAs & Wards to the extent of 100% and have covered to the extent of 98.37 % in opening of BSBD accounts. The reasons for not covering the Households to 100% are due to migration of families in search of job, unwillingness to open the accounts, unwillingness to disclose the account details, etc. The Dy. Commissioners and the Chairmen of the District Level Implementation Committee-PMJDY of all the Districts have certified that their Districts as saturated. In the State Level Monitoring Committee of PMJDY held on 20.1.2015 the matter was deliberated and upon observing the performance under the scheme declared the State as Saturated under PMJDY. Moreover, the Bankers were advised to continue opening of the accounts for all those who do not have Bank accounts (uncovered Households or other individuals). The Pradhan Mantri Jan Dhan Yojana (PMJDY) was launched on 28th August 2014 by the Hon’ble Prime Minister at Delhi and simultaneously at State Level and District Levels. The programme aims to provide banking services to people in rural and urban areas particularly in the vulnerable groups such as weaker sections and low income groups. The purpose is to ensure that one bank account for each household is opened all over the country. Since the launch of the programme and upto 30.5.2015, the Banks have opened 71.89 lakh BSBD accounts. Of which, 33.79 lakh accounts are with ‘zero’ balance and the remaining 38.10 lakh accounts with balance of Rs. 647.96 crore. The total number of accounts with Aadhaar seeding is 41.36 lacs. The number of a/cs in rural areas is 43.46 lakh and in urban areas is 28.43 lakh. The Banks have so far issued 63.84 lakh Rupay cards. The Hon’ble Prime Minister launched the captioned schemes on 9th May 2015 at Kolkata at the national level. The State Level simultaneous Launching Programme was organized at Banquet Hall, Vidhana Soudha, Bengaluru on 9th May 2015 in association with Govt of Karnataka, Member Banks and Insurance Companies. Sri Siddaramaiah, Hon’ble Chief Minister, GoK, Sri Ananth Kumar, Hon’ble Union Minister for Chemicals & Fertilizers, GoI, Sri V. Srinivasa Prasad, Hon’ble Revenue Minister, GoK, Sri Ramalinga Reddy, Hon’ble Minister for Transport, GoK, Sri P.C. Mohan, Hon’ble MP of Bengaluru Central, Sri Shivkumar Udasi, Hon’ble MP of Haveri, Sri Suresh Kumar, MLA, Sri B.N. Vijaya Kumar, MLA, Smt Latha Krishna Rao, Addl. Chief Secretary & Dev. Commissioner, GoK, Sri Umashankar, Secretary, Finance Dept., GoK, Smt Arundhati Bhattacharya, Chairman, State Bank of India, Sri Eugene E Karthak, Regional Director, RBI, Sri Sharad Sharma, MD, State Bank of Mysore, Sri T.K. Srivastava, ED, Syndicate Bank, Sri R.S. Pandey, ED, Syndicate Bank, Sri K.R. Shenoy, ED, Vijaya Bank, Smt Asha Nair, Director & General Manager, United India Insurance Co., participated in the programme. Around 1200 persons participated in the programme consisting of Bank / Insurance Co., Executives, Govt. officials & beneficiaries. The scheme provides accidental death insurance to the Savings Bank account holders in the age group of 18-70 years with insurance cover of Rs. 2.00 lacs for accidental death and Rs. 1.00 lac for partially disabled due to accident. The premium amount will be Rs. 12/- per annum, through auto debit mode from the Bank a/c of the subscriber. The subscriber can join the scheme before 31st August 2015 by giving standing instructions for auto debit every year. The scheme provides life insurance cover to the Savings Bank account holders in the age group of 18-50 years with risk coverage of Rs. 2.00 lacs in case of death due to any reason. The premium amount will be Rs. 330/- per annum, through auto debit mode from the Bank a/c of the subscriber. The subscriber can join the scheme before 31st August 2015 by giving standing instructions for auto debit every year. The scheme is an improved version of Swavalamban Scheme under National Pension System (NPS) administered by PFRDA, which covers unorganized sector. All the Savings Bank a/c holders are eligible under the scheme with age limit 18-40 years. The scheme provides for fixed pension guarantee for subscribers. Contribution of 50% of subscriber contribution or Rs. 1,000/-, whichever is less to eligible subscribers. Reimburse promotional and development activities including incentives to contribution collection agencies. Rs. 1,000/- to Rs. 5,000/- per month in multiples of Rs. 1,000/- depending on their contributions and age of joining the scheme. All service providers and aggregators under Swavalamban scheme through NPS. Conducted several rounds of meeting of Banks/Insurance Companies to work out strategy for smooth launch of the programme in the State. The guidelines of the schemes along with application forms were translated into Kannada and circulated to all the Banks with an advice to make available the forms at all their Branches / BC Points before 30th April 2015. All the Banks were advised to take up enrolment of applications by organising camps at all their Branches commencing from 1st May 2015. Workshop for Bankers on Atal Pension Yojana (APY) was organized at Syndicate Bank Training Centre, Bengaluru in coordination with PFRDA. A Call Centre is in place to attend enquiries / address the grievances of the customers with Toll Free No.1800 4259 7777. 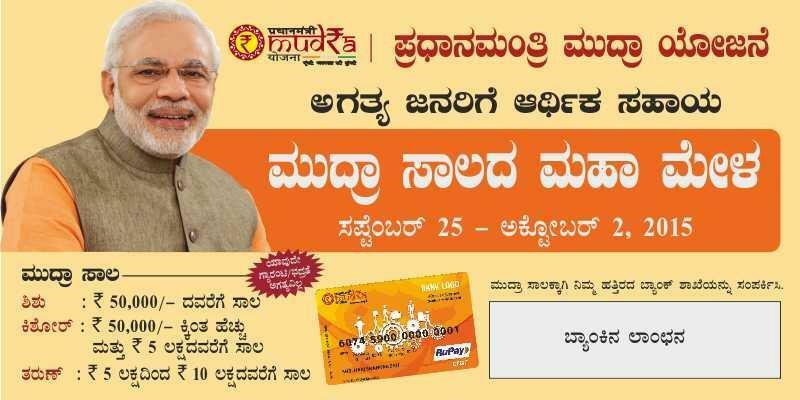 The Micro Units & Development Agency Ltd. (MUDRA) was launched by the Hon’ble Prime Minister on April 8, 2015, as a new financial entity, for developing and refinancing last mile financial intermediaries like Banks, NBFCs, MFIs, etc., who are in the business of lending to smaller of the micro enterprises in manufacturing, trading and service sector. As per NSSO estimate, about 5.77 crore such units exists in the country and a great majority of them are outside the formal banking fold and are unable to sustain or grow due to lack of finance or relying on informal channels, which are very expensive or unreliable. On the same day, Pradhan Mantri MUDRA Yojana was launched to ‘fund the unfunded’ by bringing such enterprises to the formal financial system and extending affordable credit to them. The banking sector consisting of Commercial Banks, RRBs and Cooperative Banks can play an important role in extending credit to this sector. It is felt that there is a need to give a special boost to bank finance to this segment on a mission mode, considering the enormous task in reaching to the large number of such units, currently excluded from the formal banking system. This segment mainly consists of non-farm enterprises in manufacturing, trading and services whose credit needs are below Rs.10.00 lakh. It has been now decided that the loans to be given to this segment for income generation will be known as MUDRA loans under the Pradhan Mantri MUDRA Yojana (PMMY) and branded accordingly. The overdraft amount of ` 5,000 sanctioned under PMJDY may also be classified as MUDRA loans under PMMY and in turn all need to be classified as Priority Sector Advances. It would be the endeavour of MUDRA that at least 60% of the credit goes to Shishu Category Units and the balance to Kishor and Tarun Categories.